New customers only. Min Deposit: £10. First deposit matched up to £30. 1 x wagering at odds of 1.75+ to unlock Free Bet. Credit card, debit card & PayPal deposits only. Terms apply. Betway.com is a Malta-based betting company that has become a go-to online destination for European and UK customers looking to bet on esports. As one of the first sportsbooks to offer proper betting markets on popular esports events for Counter-Strike: Global Offensive, Dota 2 and League of Legends, it has gained a loyal following among many in the esports community for its active involvement as a sponsor for several competitions including the ESL UK Premiership 2015, Dreamhack Cluj 2015, ESG Tour 2017 and ESL Pro League 2017. Betway is also the principal sponsor of Ninjas in Pyjamas, one of the biggest professional teams names in the CS:GO and LoL competitive scene, and was the first UK-based sportsbook to invest in an esports team and become part of the Esports Integrity Coalition. This review will take a closer look at Betway’s services, including customer support, deposit and withdrawal methods, esports betting options, licensing and security and ultimately whether it lives up to its reputation as a premier esports betting destination. Betway is based in Malta and licensed both there and in the United Kingdom, providing esports, racing and sports betting services to players from all around the world. Presently, this includes the following: Austria, Belgium, Canada, Denmark, Finland, Germany, Italy, Liechtenstein, Luxembourg, Netherlands, Norway, Poland, Spain, Sweden, Switzerland and the United Kingdom. You can verify if players from your country are accepted by heading over to the registration page and selecting your region from the drop-down list. Regardless of which permitted country you are betting from, Betway requires all new sign-ups to be over 18 years of age or above the legal age for gambling in your country. Due to different international gambling laws, there are certain countries and regions unfortunately restricted from signing up at Betway, which includes Australia, Afghanistan, Angola, Bosnia, Bulgaria, France, Greece, Greenland, Guyana, Hungary, Iran, Iraq, Israel, Lithuania, Mexico, Myanmar, North Korea, Papua New Guinea, Philippines, Romania, Russia, Singapore, South Africa, Syria, Turkey, Uganda and the Unites States of America. If you are reading this Betway review from an excluded region, we recommend reading our esports betting sites guide to find the best options for your country. New members at Betway can score up to £30 in bonus bets upon joining. All you have to do is register, log in and add at least £10 with your first deposit. Betway will then match that transaction up to a maximum of £30 in bonus bets*. For example: if you deposit £30, you get another £30 in bonus bets on top. Best of all, you can split that bonus amount any way like – you don’t have to bet it all at once. Find out more, including complete terms and conditions, at Betway.com. * New customers only. Min Deposit: £10. First deposit matched up to £30. 1 x wagering at odds of 1.75+ to unlock Free Bet. Credit card, debit card & PayPal deposits only. Terms apply. The design and navigation of Betway’s dedicated esports portal is clean and accessible for both experienced and new esports bettors. The black, white and purple colour scheme is easy-on-the-eyes and the basic design is typical of most modern-day online betting sites, with all sports markets, including esports, accessible via the menu on the left-hand side. The ‘Quick Links’ section at the top of that allows players to get to the most popular esports betting options fast, including Counter-Strike: Global Offensive, Dota 2, League of Legends and markets offered on the the major ECS and World Championships events. With minimal advertisements aside from Betway’s own latest promotions, the desktop site is clutter-free and sleek. Odds on Betway are by default displayed in Decimal, but you can switch this to Fractional or American by using the drop-down menu on the top right of every page, next to the support button. Betway is fully supported for Android, iOS, Microsoft Windows, Oppo and other mobile smartphone and tablet devices via standard Web browser and their official Betway mobile app (download here). The mobile site is neatly condensed for the smaller screen, but the betting experience and the esports betting options available are exactly the same and it comes down to device preference and whether you like to bet more on-the-go than while you are on the computer. Betway.com’s esports betting markets focus heavily on Counter-Strike: Global Offensive, Dota 2 and League of Legends, the world’s most popular (and lucrative) esports titles, with regular major and minor tournaments held around the world with prize-pools going into the millions. Expect to find markets and be able to bet on the Blast Pro Series, ESEA Australia/North America, Intel Extreme Masters, Dota Pit League, Perfect World Masters, and LoL World Championships, as some popular examples. You can place wagers on Match Winner and Map Winner for all games, along with special-game specific bets such as First Blood (CS:GO) and First Baron/Inhibitors/Tower (Dota 2). Betway were also one of the first betting sites to offer in-play betting on esports, with CS:GO being their most popular. 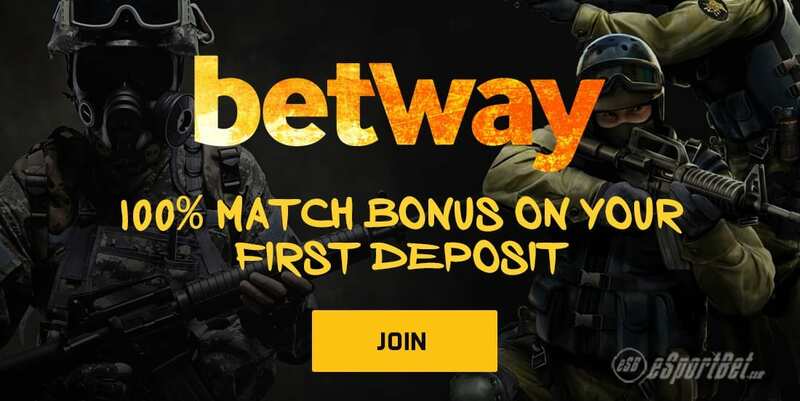 It’s no surprise Betway are particularly popular with CS: GO fans who love to place a bet given Betway are the official sponsors of Ninjas in Pyjamas, one of the biggest names in the Counter-Strike professional gaming scene for the past two decades. There’s special NiP odds whenever they have a upcoming match offered by Betway, along with contests and free bet giveaways, so keep an eye out. Betway.com presently allows customers to bet with the following currencies: British Pound (GBP), Czech Koruna (CZK), Euro (EUR), Norwegian Krone (NOK), New Zealand Dollar (NZD), Polish Zloty (PLN), Swedish Krona (SEK) and United States Dollar (USD). Betway supports a decent number of different languages for its users – you can select the language the site is displayed in by clicking the desired option listed at the footer of every page. At the time of this review, the following languages were available: English, Czech, Danish, Finnish, French, German, Greek, Latvian, Italian, Norwegian, Polish, Portuguese, Russian, Spanish and Swedish. Betway is 100% legitimate and safe when it comes to online betting. The site is managed by Betway Group/Betway Limited and licensed and regulated by the United Kingdom Gambling Commission under licence number: 000-039372-R-319367-010 for customers residing in Great Britain. For customers outside of the UK, Betway Limited also holds multiple licenses with the Malta Gaming Authority, with its sportsbook falling under license number: MGA/CL2/396/2007. Both aforementioned jurisdictions are considered the most trustworthy authorities in the world when it comes to anything online gambling related, so there is little doubt Betway isn’t safe or playing by the rules. The fact the site is very transparent when it comes to their licensing (listing it openly at the footer of every page) gives extra peace-of-mind for all bettors as to their legitimacy, so we definitely can recommend them to our readers based on good-standing reputation. Betway employ Secure Socket Layer (SSL) digital encryption technology to safeguard all financial transactions and personal information of its customers, and is audited by London-based independent online gambling testing agency and certification body eCOGRA (eCommerce Online Gaming Regulation and Assurance), displaying its official eCOGRA Seal of Approval on-site. Betway has 24/7 customer support for all customers, with email, live chat and telephone hotline options. Betway.com is a fantastic esports betting site which actually has proven knowledge and involvement with the competitive gaming scene, offering great odds, bet types, specials and promotions to compliment the esports betting experience. It suits both experienced bettors and users new to esports wagering in general, with an easy-to-navigate site and world-class licensing and regulation in Malta and the United Kingdom ensuring fair and responsible gaming practices and payouts.